Click Here to See Our Ad! The ECOSLUG® ML-NRBP bullet is a non-lead slug for use in replica/modern muzzleloaders, both traditional-styled and in-line. They are designed to be used with a .50 caliber sabot that accepts a .451/.452” diameter bullet (a sabot is supplied) in a .50 caliber muzzleloading rifle. In some cases the bullet can be used in larger calibers AS LONG AS an appropriate sabot is used that provides a proper fit in the bore. It is proudly made in the USA. In most cases, from a regulatory standpoint “lead-free” and “non-lead” (less than 1% lead by weight), mean the same thing. As can be seen in the lab test reports posted on our web site, the percentage of lead found in a sample of the steel used in the ECOSLUG® bullets was less than 0.005% by weight. In the case of the aluminum used for the head, the result was a lead content of 0.01% by weight. This very miniscule lead content falls well below the 1% lead limit criteria used by the California Department of Fish and Wildlife for a bullet to be allowed for use in its “non-lead” hunting areas. The ECOSLUG® bullet is included on that state’s Certified Non-lead Ammunition list. Compared to other “Lead-Free” muzzleloading bullets, the ECOSLUG® has two unique features. The first is its steel body, which expands upon impact, forming tough steel petals that plow into the target, depositing the bullet’s energy with 100% weight retention. The other unique feature is the bullet’s threaded nose. This allows a stuck bullet to be more easily removed from muzzleloaders with non-removable breech plugs (hence the NRBP suffix). This will be discussed in more detail later. The ECOSLUG® bullet’s steel body (called an expansion sleeve) is annealed with a special process that softens the steel but increases its toughness and ductility. Inside the expansion sleeve is a “penetrator core”, composed of a steel shaft and an aluminum head. 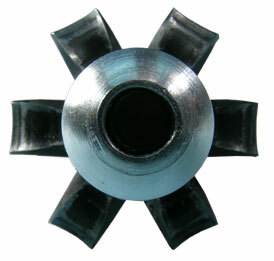 The expansion sleeve has six slots that form “petals” when the inner penetrator core hits the target and is pushed back into the expansion sleeve. The expansion sleeve and penetrator core are designed to stay together upon impact. While it is possible for an extreme situation to cause a petal to break off, the steel petals are very tough. In all of our tests, conducted both in Permagel® Ballistic Gelatin and in actual hunting situations, the ECOSLUG® has had 100% weight retention after hitting the target. Although the bullet body is steel, the annealing process makes it softer than the steel used in modern replica muzzleloader barrels. And since the bullet has an aluminum head and the steel body is within the plastic sabot, the steel body should never come in contact with the barrel if the bullet is properly seated in the sabot. The ECOSLUG® ML-NRBP is, at 177 grains, a relatively light bullet when compared to lead .50 caliber muzzleloader bullets that typically weigh from 250-350 grains. This is due to being made mainly of steel. However, its 100% weight retention offsets this to some degree. Also, its relatively light weight does increase velocity and reduce recoil. Another fact that one should consider is that the ECOSLUG® bullet is the same weight as a .490 diameter lead ball used in .50 caliber muzzleloaders. Extensive shooting tests were done to develop the ECOSLUG® bullets. In the modern in-line muzzleloaders used in the testing, the load chosen was two Hodgdon® Triple Seven™ 50 grain Muzzleloading Propellant Powder Pellets (100 grains total). In addition, the development and testing of the ECOSLUG® was done with the sabots that come packaged with them. The user may want to tailor the powder load to what works well in his or her muzzleloader. However, in all cases the user should comply with the maximum powder recommendations of both the gun and powder manufacturers. Testing was done with a variety of in-line modern muzzleloading rifles. This included a Traditions Pursuit™, a Thompson-Center Encore® with a 28-inch Prohunter™ barrel, a Knight® in-line “Rolling Block” model, and a CVA® Optima™. All of these have a 1-28” twist. In addition, the ECOSLUG® was tested in modern/replica traditional-styled muzzleloaders including the Thompson-Center Renegade® and Lyman Great Plains Hunter®. While it may perform equally well in other makes and types, the ECOSLUG® is intended to be used with a sabot in .50 caliber muzzleloading rifles that can safely handle the powder load you are using. As is normally the case with saboted bullets, a relatively fast twist (1-28” to 1-48”) will give the best results. In the .50 caliber muzzleloaders mentioned here, the supplied sabot should provide a good fit in the bore. In .54 and .58 caliber muzzleloaders, the user will need to provide a sabot other than the ones supplied. In addition, some .50 caliber muzzleloaders (such as Pedersoli models) have slightly tighter bores which may require a different sabot. 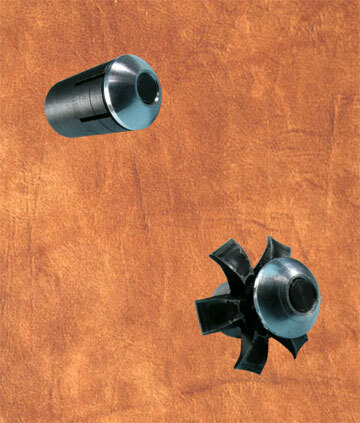 The ECOSLUG® is not recommended for use in patched round ball barrels with a slow twist and deep rifling. In chronograph tests, the ECOSLUG® bullet’s muzzle velocity with a powder load of two Hodgdon® Triple Seven™ 50 grain Muzzleloading Propellant Powder Pellets (100 grains) was approximately 2100 feet per second. In addition, expansion and penetration tests were performed. These were done by shooting the ECOSLUG® bullets into Perma-Gel®, a proprietary user-friendly ballistic gelatin. Photos are included on our web site of bullets recovered after test firing into the Perma-Gel, all of them having 100% weight retention. One thing should be kept in mind about the ECOSLUG® bullet and expansion. Any bullet can fail to expand 100% of the time due to various factors. The ECOSLUG® needs sufficient velocity to expand. Because of its relatively light weight compared to lead bullets, the ECOSLUG® is launched at a high initial velocity. However, it also losses its velocity more quickly than a heavier bullet. A comparison can be made with the behavior of steel shot for duck hunting. It also tends to have a higher initial velocity than lead shot, but then loses its velocity faster due to its lighter weight. For this reason, it is advised to limit shots at game with ECOSLUGs® to 100 yards. This will result in a high probability of reliable bullet expansion. The suffix letters in the ECOSLUG® ML-NRBP name stand for MuzzleLoading Non-Removable Breech Plug. This bullet provides a non-lead option for use in traditional-styled muzzleloaders with breech plugs that are not readily removable. With muzzleloaders, there is always a chance of getting a bullet stuck in the barrel. This can occur because of forgetting to put the powder in before the bullet. Or, a bullet can get stuck halfway down the barrel due to not sufficiently cleaning the fouling between shots. With a traditional-styled muzzleloader, this can be a real problem. With non-lead/lead free bullets, a lead ball puller will not work as the bullet material is generally too hard. While a CO2 ball discharger is another option in getting out a stuck ball, they do not always work with saboted bullets. This is because a sabot does not expand and develop its full gas seal until it is fired. While a traditionally-styled muzzleloader’s breech plug can be removed as a last resort, this can be difficult to do and is definitely not something that you can do in the field. The ECOSLUG® ML-NRBP has a patented feature that allows it to be pulled out of the barrel in a manner similar to how a lead ball puller works. The nose of the ECOSLUG® ML-NRBP has an internal 10-32 threaded hole. In the event of a stuck bullet in the barrel, the extraction tool (included in EACH pack of bullets) can be threaded onto your 10-32 thread ramrod tip. With this extraction tool threaded onto the tip of your ramrod, you can now screw it into the nose of the stuck bullet, and pull it out of the barrel. While no method is 100% reliable with a severely stuck bullet, in our tests this works in most cases. For those of you wanting to (or required to) shoot a non-lead bullet in a traditionally-styled muzzleloader, this feature will give you added peace of mind that a stuck bullet will not ruin your day hunting or on the range! Keep your face and body away from being directly over the muzzle of the barrel when removing a stuck bullet! This precaution should always be followed with muzzleloaders, including during the loading process.